What’s green, delicious and great for your health? Quite a few things actually. One of those things is green tea. 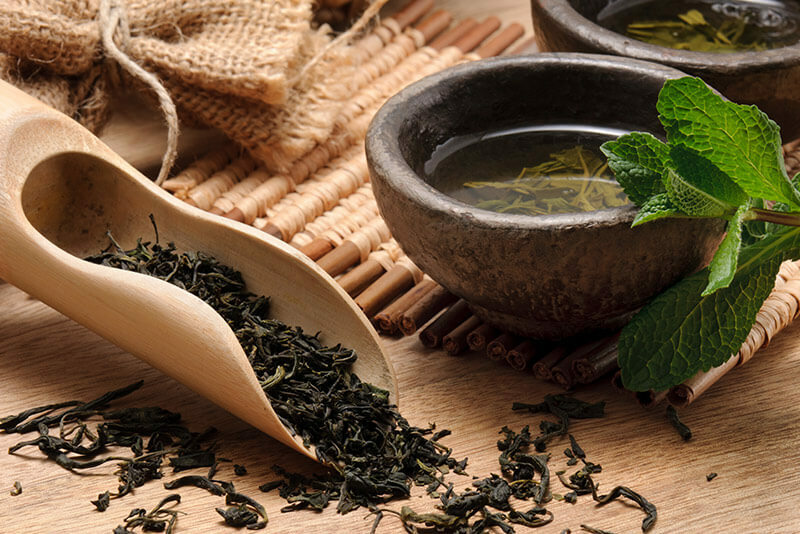 Esteemed for its gentle, calming effect, green tea also has a reputation for being remarkably healthy beneficial. As with most teas, green tea originates from China, where it has been a staple for thousands of years. There, it has long been held that green tea is good for health. Indeed, ’The Book of Tea’, published by a Zen month in the 12th century, claimed that regular consumption improves the function of five vital organs. The beverage has been used in traditional Chinese and Indian medicine for a variety of purposes, including as an aid for digestion and the improvement of heart health. Sounds great! But, you might be wondering, what does science say on the subject? Does green tea live up to the hype? We looked at the facts to give you the run down on all the benefits of green tea. First, what is green tea, exactly? Like all non-herbal teas, it is brewed from the dried leaves of the Camellia sinensis bush. The type of tea is determined by the level of oxidation of these leaves. 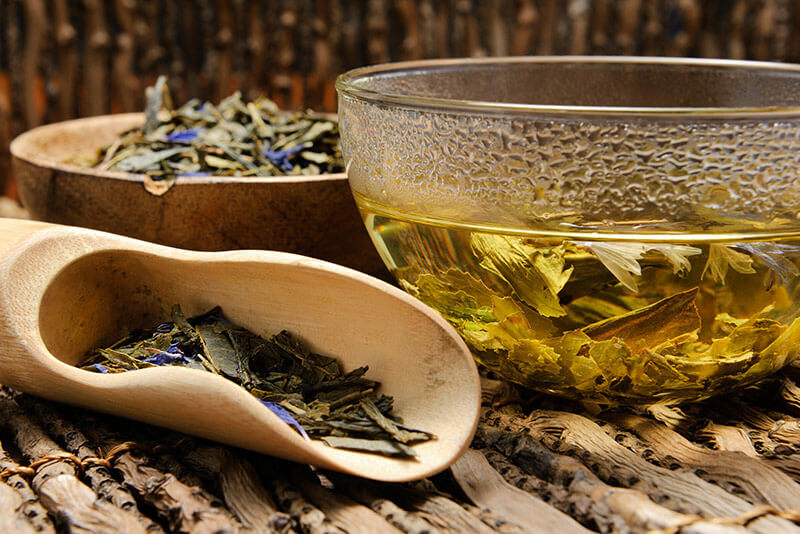 Green tea, made from unoxidised leaves, is one of the least processed types of tea. This means that green tea contains a lot more antioxidants and beneficial polyphenols than regular tea. It contains caffeine, but not as much as other varieties of tea, and only a third or a quarter as much as the same amount of coffee. Even so, people with severe caffeine sensitivities might be better off avoiding it. Otherwise, there are no known adverse effects associated with green tea consumption. There are, however, a fair few positive ones. Let’s have a look. Green tea is great for the brain. This is due to its caffeine content and high instance of the amino acid L-theanine. A 2008 meta-study of the effects of low to moderate caffeine consumption found that it consistently leads to improvements in various aspects of brain function, including improved mood, vigilance, reaction time and memory. For its part, L-theanine has anti-anxiety effects, which are perfect to combat the sometimes jitter-inducing effects of the caffeine. Studies have shown that caffeine and L-theanine are a great combination – particularly effective at improving brain function when consumed together. Green tea is great for the brain in the long term as well. After multiple studies examining the neuroprotective effects of green tea catechin compounds, scientists are tentatively suggesting it may lower the instance of the two most common neurodegenerative diseases: Alzheimer’s disease and Parkinson’s disease. These catechins have a variety of uses. In addition to potentially keeping your brain healthy into old age, they also inhibit the growth of harmful bacteria in the mouth. Given these bacteria are responsible for plaque formation and tooth decay, green tea is a great way to improve your dental health. That’s not all, however. This innocuous green fluid happens to be one of the best treatments for bad breath! Cardiovascular diseases, meaning any disease involving the heart or blood vessels, are the primary cause of death in the world. Regular green tea consumption might reduce the instance of these diseases, however. This Japanese 40,000-person study, for example, found that “green tea consumption was inversely associated with mortality from cardiovascular diseases.” Although the exact mechanism for this effect remains unclear, it might be due to the high antioxidant content of green tea, which has been the subject of several studies. Research from Japan’s Juntendo University School of Medicine indicated that “that a diet high in antioxidants is associated with a reduced risk of cardiovascular disease.” However, the authors could not find a strong causality link. While scientists are uncertain how it is the case, there seems to be some basis for the claim green tea is good for the heart. The cumulative effect of all this healthiness is quite remarkable. Another large Japanese study of individuals between 65 and 84 found that those who drank the most green tea were 76% less likely to die during the six-year period measured. Know that nutrient levels differ from green tea to green tea – be sure to compare a few labels at the store. Enjoy! And let us know in the comments if you’re a green tea fan.